Dental erosion is often described solely as a surface phenomenon, unlike caries where it has been established that the destructive effects involve both the surface and the subsurface region. However, besides removal and softening of the surface, erosion may show dissolution of mineral underneath the surface. There is some evidence that the presence of this condition is growing steadily. Hence, erosive tooth wear is becoming increasingly significant in the management of the long-term health of the dentition. What is considered as an acceptable amount of wear is dependent on the anticipated lifespan of the dentition and, therefore, is different for deciduous compared to permanent teeth. However, erosive damage to the permanent teeth occurring in childhood may compromise the growing child’s dentition for their entire lifetime and may require repeated and increasingly complex and expensive restoration. Therefore, it is important that diagnosis of the tooth wear process in children and adults is made early and adequate preventive measures are undertaken. These measures can only be initiated when the risk factors are known and interactions between them are present. A scheme is proposed which allows the possible risk factors and their relation to each other to be examined. As lifestyles have changed through the decades, the total amount and frequency of consumption of acidic foods and drinks have also changed. Soft drink consumption in the USA increased by 300% in 20 years, and serving sizes increased from 185 g (6.6 oz) in the 1950s to 340 g (12 oz) in the 1960s and to 570 g (20 oz) in the late 1990s. Around the year 1995, between 56 and 85% of children at school in the USA consumed at least one soft drink daily with the highest amounts ingested by adolescent males. Of this group, 20% consumed four or more servings daily. Studies in children and adults have shown that this number of servings per day is associated with the presence and progression of erosion when other risk factors are present. It becomes obvious that with the increased popularity of soft drinks the consumption of milk may decrease in children and adolescents, which could result in calcium deficiency, thus jeopardizing the accrual of maximal peak bone mass at a critical time in life. Early diagnosis is important. Dental professionals will typically ignore or overlook the very early stages dismissing minor tooth surface loss as a normal and inevitable occurrence of daily living, being ‘within normal limits’ and thus not appropriate for any specific interventive activity. Only at the later stages in which dentine has become exposed and possibly sensitive, and the appearance and shape of the teeth altered that the condition becomes evident at routine examination. There is no device available for the specific detection of dental erosion in routine practice. Therefore, the clinical appearance is the most important feature for dental professionals to diagnose dental erosion. This is of particular importance in the early stage of erosive tooth wear. The appearance of a smooth silky-glazed appearance, intact enamel along the gingival margin, change in color and cupping and grooving on occlusal surfaces are some typical signs of early erosion. However, it is difficult to diagnose erosion at an early stage and it can be very difficult to determine if dentine is exposed or not. Even if a clinician is able to diagnose tooth wear, the differential diagnosis of erosion, abrasion or attrition may be a challenge either through lack of awareness of the multifactorial and overlying etiologies. It is possible to use disclosing agents to render dentine involvement visible. Only a dentist with the diagnostic capability of distinguishing early erosion from the other noncarious defects will be in a position to deliver timely preventive measures. Indeed, these conditions may occur simultaneously. In children, the most commonly reported areas with wear are occlusal surfaces of molars and incisal surfaces of incisors. These surfaces are also associated with attrition and it can be difficult to separate what is being caused by erosion from what is being caused by other tooth wear factors. For these and other reasons the terms ‘erosion’ and ‘erosive tooth wear’ are used in this book interchangeably demonstrating the overlapping nature of this condition. Erosion is often described solely as a surface phenomenon, unlike caries where it has been established that the destructive effects are both on the surface and within the subsurface region. However, the pathophysiology of erosion is more complex. When a solution comes in contact, with enamel, it has to diffuse first through the acquired pellicle and only thereafter can it interact with enamel. The acquired pellicle is a biofilm, free of bacteria, covering oral hard and soft tissues. It is composed of mucins, glycoproteins and proteins, amongst which are several enzymes. On the surface of enamel, the acid with its hydrogen ion (or a chelating agent) will start to dissolve the enamel crystal. First, the prism sheath area and then the prism core are dissolved, leaving the well-known honeycomb appearance. Fresh, unionized acid will then eventually diffuse into the interprismatic areas of enamel and dissolve further mineral underneath the surface, in the sub-surface region. This will lead to an outflow of ions and subsequently to a local pH rise in the tooth substance and in the liquid surface layer in close proximity to the enamel surface. The events in dentine are in principle the same but are even more complex. Due to the high content of organic material, diffusion of the demineralizing agent (i.e. acid) deeper into the region and the outward flux of tooth mineral are hindered by the organic dentine matrix. It has been assumed that the organic dentine matrix has a sufficient buffering capacity to retard further demineralization and that chemical or mechanical degradation of the dentine matrix promotes demineralization. People who show signs and symptoms of erosion are often not aware of, and may easily be confused by, the erosive potential of some drinks and foodstuffs. Only when a comprehensive case history is undertaken will all the risk factors be revealed. However, a thorough knowledge of the erosive potential of drinks and foodstuffs is needed by the dentist, to determine the patient’s risk and to bring it in to context with the behavioral and biological factors. Knowing these factors, the reported symptoms (thermal or tactile sensitivity) and signs evident on clinical examination, and putting them in relation to the wishes, hopes and possibilities of the individual patient enables the dentist to initiate adequate preventive (noninterventive) and therapeutic (interventive) measures. When a restoration becomes inevitable, in all situations, the preparations have to follow the principles of minimally invasive treatment. 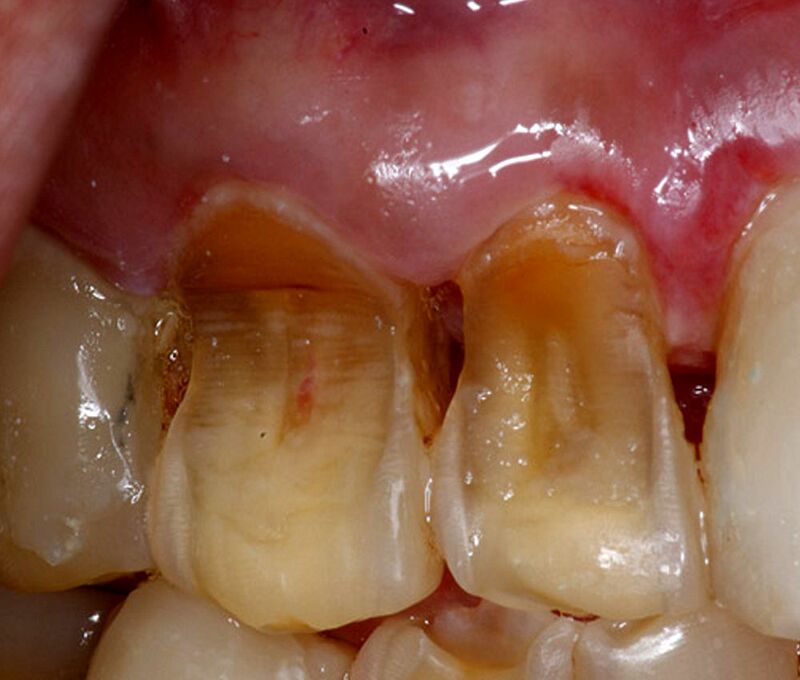 In no case may early diagnosis of erosive tooth wear be an excuse for a restoration. Instead preventive measures must be initiated to reduce the erosive challenge and to increase the protective and defensive factors thus bringing this equilibrium back to the oral environment. The clinical diagnosis ‘erosion’ is made from characteristic deviations from the original anatomical tooth morphology, thus, distinguishing acid induced tissue loss from other forms of wear. Primary pathognomonic features are shallow concavities on smooth surfaces occurring coronal from the enamel–cementum junction. Problems from diagnosing occlusal surfaces and exposed dentine are discussed. Indices for recording erosive wear include morphological as well as quantitative criteria. Currently, various indices are used making the comparison of prevalence studies difficult. The most important and frequently used indices are described. In addition to recording erosive lesions, the assessment of progression is important as the indication of treatment measures depends on erosion activity. A number of evaluated and sensitive methods for in vitro and in situ approaches are available, but the fundamental problem for their clinical use is the lack of re-identifiable reference areas. Tools for clinical monitoring are described. ‘Diagnosis is the intellectual course that integrates information obtained by clinical examination of the teeth, use of diagnostic aids, conversation with the patient and biological knowledge. A proper diagnosis cannot be performed without inspecting the teeth and their immediate surroundings’. This definition formulated for caries is also true for erosive tooth wear. It means that a grid pattern of criteria is pelted over the patient and thereafter the signs and symptoms are first ordered and then classified in the second step. In the same process, the native tooth anatomy and morphology memorized engram-like is compared with the actual appearance. The different chemical and physical insults on teeth cause loss of dental hard tissue with some characteristic patterns. The classification of wear is made from clinically observed morphological features. However, some indices do assume information as to the etiology such as attrition, abrasion and erosion. This approach is open to debate for two reasons: an association between defect morphology and the respective etiological factors has not been validly established, and the presumed etiology predetermines scientific strategies and could introduce bias. It has therefore been argued that assessing wear as the super ordinate phenomenon disregarding the shape of lesions would overcome these disadvantages. It is, however, important to note that the tissue loss ceases from progression when the cause is eliminated. Therefore, on a patient level it is a prerequisite to detect the condition early, to distinguish it from other defects and to search for the main cause in order to start the adequate preventive measures. From a clinical as well as from a scientific point of view, it would be necessary to have differentiating diagnostic criteria available. The early signs of erosive tooth wear appear as a smooth silky-shining glazed surface. In the more advanced stages changes in the original morphology occur. On smooth surfaces, the convex areas flatten or concavities become present, the width of which clearly exceeds its depth. Undulating borders of the lesion are possible. Initial lesions are located coronal from the enamel–cementum junction with an intact border of enamel along the gingival margin. The reason for the preserved enamel band could be due to some plaque remnants, which act as a diffusion barrier for acids or due to an acid-neutralizing effect of the sulcular fluid, which has a pH between 7.5 and 8.0. Further acid attacks can lead to pseudo-chamfers at the margin of the eroded surface. Erosion can be distinguished from wedge-shaped defects, which are located at or apical to the enamel–cementum junction. The coronal part of wedge-shaped defects ideally has a sharp margin and cuts at right angles into the enamel surface, whereas the apical part bottoms out to the root surface. The depth of the defect clearly exceeds its width. The initial features of erosion on occlusal and incisal surfaces are the same as described above. Further progression of occlusal erosion leads to a rounding of the cusps, grooves on the cusps and incisal edges, and restorations rising above the level of the adjacent tooth surfaces. In severe cases the whole occlusal morphology disappears. Erosive lesions have to be distinguished from attrition. They are often flat and have glossy areas with distinct margins and corresponding features at the antagonistic teeth. Much more difficult is the distinction between occlusal erosion and abrasion/demastication, which sometimes are of similar shape. Whenever possible, the clinical examination should be accomplished by a thorough history taking with respect to general health, diet and habits and by the assessment of saliva flow rates.